Estimating the Cost of Civil Litigation !! 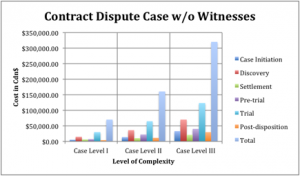 THE National Center for State Courts (NCSC) developed a model of cost estimation that is based on the time of expended by attorneys in various litigation tasks in a variety of civil cases filed in state courts. The litigation cycles are presented in another blog. The NCSC published an estimation of numbers of hour in to be used in different cases. 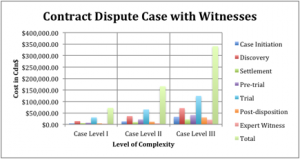 The model has three types of cases from complexity level and it assumes there are a senior attorney, junior attorney and a paralegal involved in each case. 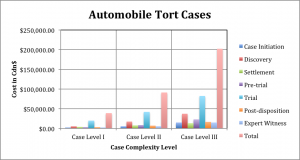 The model has six types of litigations and the time expended by attorneys is to resolve a “typical” automobile tort, premises liability, professional malpractice, breach of contract, employment dispute, and real property dispute. The model uses three levels of complexity of case. The projected effort for each level is estimated based on a survey of different attorney officer. 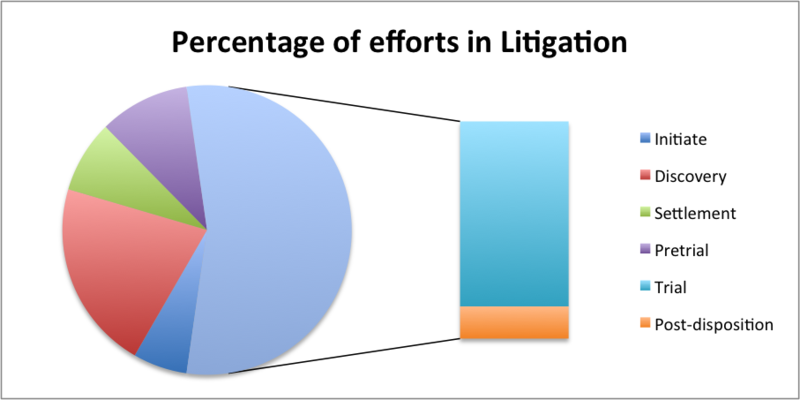 The medians of the percentage of efforts are shown in Figure 1, where each case type is split into six different litigation stages. The litigation stages will vary from a case to another based on the type of the case. The model also deals with the witness as a separate parameter. The Model did not consider the cost of production of material, cost of communication, copying or duplication, binging, transcript productions, cost of undertaking, cost of service and Court fees. The typical number of discovery does not include cost of cross-examination. In my evaluation the cost will increase by about 150% on the average if we add cross-examination, and the other costs. The Court fees are very minimal compare other cost. To understand the cross-examination cost. For each hour of cross-examination, two hours of preparation is required on the average and about $350 to produce the transcript. A typical 2 days of cross examination which will cost about 6 days of legal fee in addition to about $5600 to produce the transcript and the other cost involved with the reporters. The cost of undertaking, examining the undertaking and exchange letters to the other party. The Cost of printing or duplication will be about $1 per page and the cost of binding is premium. The Cost of sending or receiving faxes is about $2 per page. The cost of reading emails or phone is in 6 minutes increments. Note that the cost of sending 10 emails 1 line each to a lawyer will cost 1 hr to read and 1 hr to reply as lawyers will charge 6 minutes per email read and reply. Figure 2 – Figure 13 show the different project cost of different cases and the cost can reach hundreds of thousands of dollars only in legal cost. Figure 1 The median of effort in six litigation automobile tort, premises liability, professional malpractice, breach of contract, employment dispute, and real property dispute. Figure 2 The projected Cost of cases of automobile tort without an expert witness. The cases are modeled as three different levels of complexity. 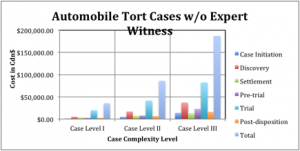 Figure 3 The projected Cost of cases of automobile tort with an expert witness. The cases are modeled as three different levels of complexity. 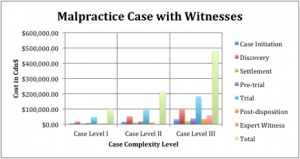 Figure 4 The projected Cost of cases of Malpractice without an expert witness. The cases are modeled as three different levels of complexity. 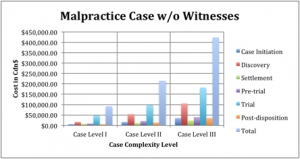 Figure 5 The projected Cost of cases of Malpractice with an expert witness. The cases are modeled as three different levels of complexity. Figure 6 The projected Cost of cases of Employment dispute without an expert witness. The cases are modeled as three different levels of complexity. Figure 7 The projected Cost of cases of Employment dispute with an expert witness. The cases are modeled as three different levels of complexity. 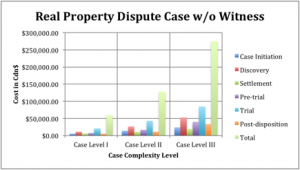 Figure 8 The projected Cost of cases of premises liability without an expert witness. The cases are modeled as three different levels of complexity. 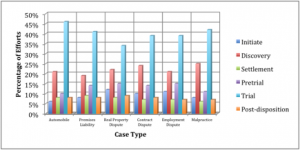 Figure 9 The projected Cost of cases of premises liability with an expert witness. The cases are modeled as three different levels of complexity. Figure 10 The projected Cost of cases of Real Property without an expert witness. The cases are modeled as three different levels of complexity. 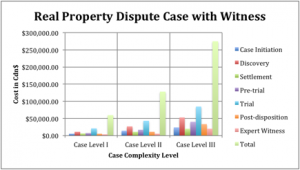 Figure 11 The projected Cost of cases of Real Property with an expert witness. The cases are modeled as three different levels of complexity. Figure 12 The projected Cost of cases of Contract Dispute without an expert witness. The cases are modeled as three different levels of complexity. Figure 13 The projected Cost of cases of Contract Dispute with an expert witness. The cases are modeled as three different levels of complexity. This post is for informational purposes only and does not provide legal advice. Materials on this website are published by Wael Badawy and to provide visitors with free information regarding the laws and policies described. However, this website is not designed for the purpose of providing legal advice to individuals. Visitors should not rely upon information on this website as a substitute for personal legal advice. While we make every effort to provide accurate website information, laws can change and inaccuracies happen despite our best efforts. If you have an individual legal problem, you should seek legal advice from an attorney in your own province/state.